Let me start by saying that I have learned my lesson after my second motorbike tumble. No more 125cc-induced wind beneath this woman’s wings. But more on that later. About a year ago, my aunt sent me this New York Times article about the Cambodian coast and wrote, “Ali, thought you’d enjoy this. Your chances of going are better than mine. Xox, Paula.” So when I faced the option of going north or south from Siem Reap, I decided to check out the “traveler’s sweet spot” for myself. After a few underwhelming days in Sihanoukville, I booked a bus to Kampot for some riverside R&R. The “bus” (read: busted minivan) was two hours late and when I boarded there were two large Styrofoam coolers leaking some sort of fish juice all along the floorboards. The Brit who hopped on after me was none too pleased and loudly voiced her dissent while also complaining about the lack of A/C (it’s a local bus—come on girl). Of course, at the end of the trip her bag was the only one that was soaked in Nemo’s bathwater. I walked away as she ranted and the driver pretended not to speak English. Gotta stay flexible ladies. The next morning I rented a motorbike for $5, filled up with $3 of gasoline, and headed down the road towards Kep, a coastal town described as Cambodia’s “St Tropez” in the 1950s. While I had done my research regarding the duration of the trip and amount of traffic (just go slow and keep an eye out for pot holes), I was in no way prepared for the red dust clouds that billowed in the wake of every moving object. It was the dust bowl, but instead of the plains of Oklahoma, I puttered past the rice paddies of Cambodia. 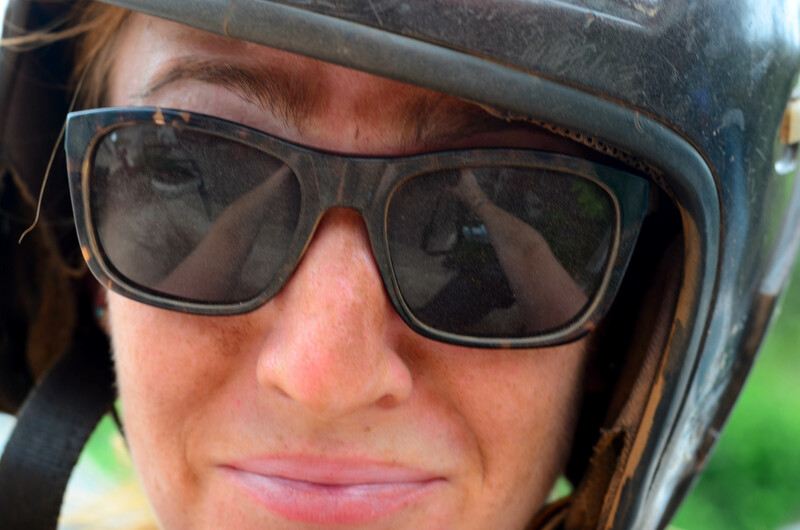 Shielded only by my glasses and constant road stops to turn and hold my breath, I was soon covered from head to toe in red dirt. When I finally arrived in Kep and parked my bike at the famous Kimley Restaurant, I looked like I had a really bad spray tan. Unfortunately, I’m intimately familiar with that look. But I had made it to Kep’s famous crab market, and that was all that mattered. After practically showering at the restaurant’s sink, I sat down at a waterfront table that offered a view of the crab traps below the floorboards. This was fresh, and I was ready. 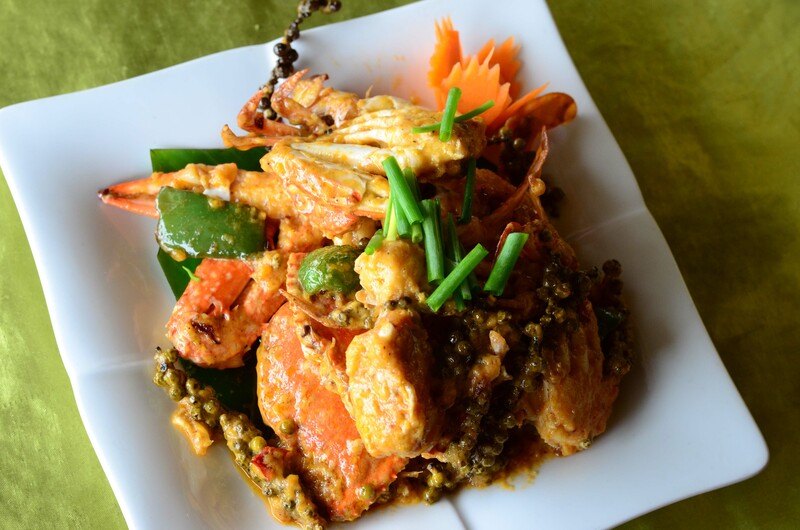 I enjoyed a mind-blowing meal of fresh crab with Kampot green peppers and a mango shake. The whopping total? $9. I am ruined. Before heading out of town, I motored around and checked out the rest of the small community of Kep. The New York Times had it right—it is special: small, quiet, and undeveloped. It would be very easy to pass lazy days in a hammock overlooking the Gulf of Thailand. Life could be worse. The drive back was, at first, uneventful enough. I slowly made my way through the dust clouds and negotiated roundabouts created by ongoing road construction. Just as I was making a slight turn and passing a few fellow motorbikes, there was a gravel pothole with my name on it. I squeezed the breaks, “skiiiiiid,” and was on the ground. It wasn’t bad—just a few scrapes on my hands, feet, and knee. A Cambodian road-worker walked over, as if to help me get up, but instead literally stood over me and laughed. I am not joking. I looked at him as if he had killed my puppy. For those of you that remember when I ran into a bunch of parked bikes in Hoi An, this is a reoccurring theme. I can only be comforted by the fact that I don’t work at a food cart or a roundabout in the Cambodian country side so many times. It is time to give up the bikes. I returned to Kampot and turned in my motorbike without incident. Was it worth it for the crab? 100%, absolutely, YES. But next time, I’ll take a taxi. Farang Tattoos: Get one while it’s hot! Yep, it was a motorbike with only two wheels. Escaped relatively unscathed (and unsore). Quitting while I’m ahead!